Maximum corn yield in Minnesota is generally obtained when planting occurs in late April or early May. In years when spring arrives early, a mid-April planting date can produce similar yield if young plants are not damaged by a freeze in May. In years when few growing degree days are accumulated during late April and the first half of May, maximum corn yield also can be obtained when planting occurs in mid-May. In most cases, corn yield in Minnesota is reduced when planting is delayed beyond mid-May. If planting is delayed beyond the third week in May, switching late-maturity hybrids to earlier-maturity hybrids reduces the risk of corn freezing in the fall before it has reached maturity. Photo 1. Seedbed preparation under good soil conditions. Photo 2. Nodal roots of corn are located between the seed and soil surface. Barriers to nodal root establishment can reduce yield and increase potential for root lodging. Although timely planting is important, it is equally important to avoid pre-plant tillage and planting when soils are wet. In general, a field is ready for seedbed preparation when soil in the depth of tillage crumbles when squeezed. 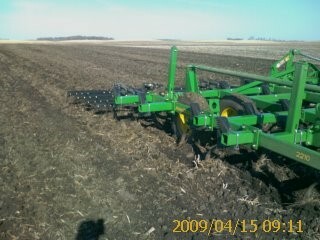 Pre-plant tillage when soils are wet can create a cloddy seedbed that reduces seed-to-soil contact. Achieving excellent seed-to-soil contact is important for rapid and uniform imbibition of moisture by seeds. Tillage when soils are wet also can create a zone of compaction just below the depth of tillage that can restrict root development. Sidewall compaction can occur when planter disc openers cut through wet fine-textured soil, resulting in compacted soil around the seed that is difficult for nodal roots to penetrate. In addition, seed furrows can open following planting in such conditions, resulting in poor seed-to-soil contact and poor stand establishment. A firm seedbed at planting is critical for good seed-to-soil contact and establishment of the nodal roots which develop near the soil surface. A seedbed can be considered too loose if one sinks greater than one inch when walking through the field, but this can vary with planting equipment. At the same time, avoid excessive pre-plant tillage, which can result in surface crusting and emergence problems if heavy rainfall occurs prior to emergence. 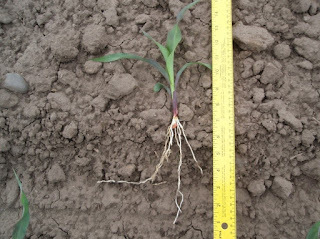 Excessive pre-plant tillage also enhances the risk of wind erosion and sandblasting to corn seedlings. 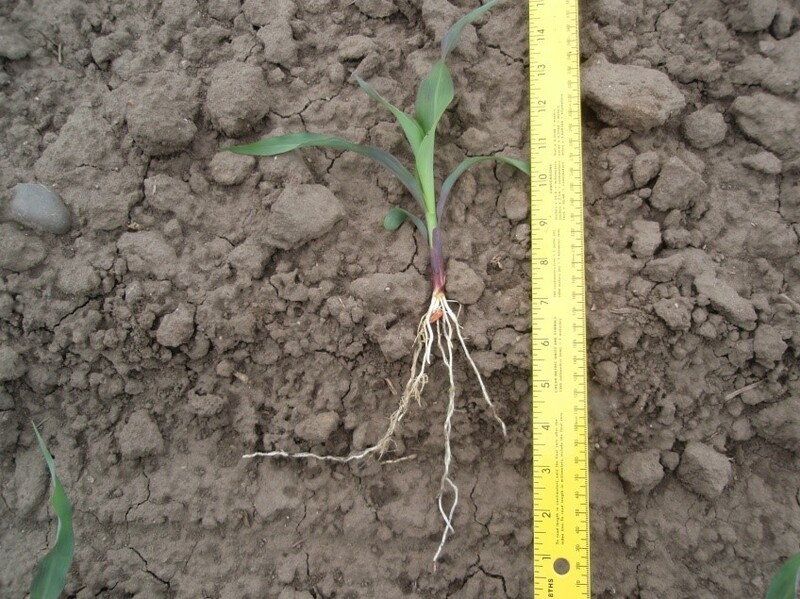 A planting depth of 2 inches is optimal for corn in most situations in Minnesota. Shallow placement of seed increases the risk of poor nodal root establishment. High planting speeds that result in bounce of planter units should be avoided, as this can result in shallow placement of some seeds and variable emergence. Optimal corn planting rates vary somewhat with hybrid, soil productivity, and expected yield. However, planting rates of 34,000 to 36,000 seeds/acre generally maximize economic return in most fields in Minnesota. A final stand that is 5% less than the planting rate is common, but can vary somewhat based on a variety of factors. Planting too many seeds generally does not reduce corn yield, but it can reduce economic return. Additional information on corn production from University of Minnesota Extension is available at: http://z.umn.edu/corn.